Never would I imagine taking photos at a funeral, but I have learned never to say never. Last week I got called to do a funeral for a young man who had died. His family had been Catholic from way back, but were “not very religious” and his mother had never gotten around to getting him baptized. The funeral home could not get a priest. So as often happens, I got a call asking if I’d be willing to officiate the memorial. The local funeral homes call me when they have “unusual” situations, when families don’t have a pastor or priest, or they feel they need an officiant who will be able to roll with the punches. I’ve had some interesting experiences in this ministry (although I’m sure nothing compared to funeral directors who’ve been in the business for many years.) I’ve done funerals where the cops were called, where family members jumped on the coffin, a grieving daughter screams about the coffin not being “sealed” properly. I’ve officiated funerals where no one spoke because there was not one good to say. 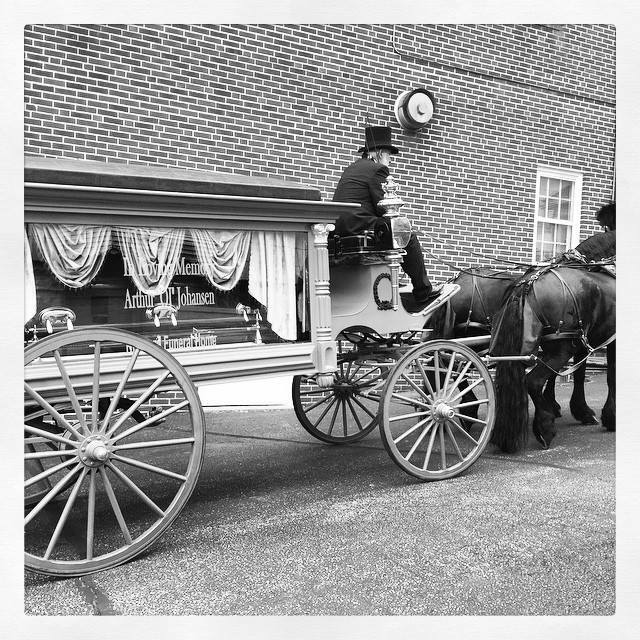 It felt strangely natural as we got out of our cars and followed behind the horse and carriage at the cemetery. Truly, it was something that mourners did for centuries before limousine style hearses came into fashion. Someone carried a music box, we wore our beads, and we walked up the hill to the site where the young man was laid to rest. Some older relatives were whispering as they walked about his not being baptized, so I scrapped the Dr. Who quote I was going to read for the story of Nicodemus and Jesus from the Gospel of John. I pulled it up on my phone (thank God for online Bibles! ), and talked about how, while there are traditional ways of “coming to God” through Baptism and Communion, this scripture tells us a story of a man who was unable to come to Jesus by his society’s accepted norms. He was a Pharisee and was not able to publicly acknowledge his relationship with Jesus. So Nicodemus came to Jesus at night. Long ago, as I myself sat in a church that had VERY definite roles about “how to come to Jesus,” a very subversive Sunday School teacher told me that God is there for us anytime we need God. Anytime we come. In the bright of day, in the dark of night, in public, in secret. God just invites us to come, anyway we can. Nicodemus did, and the young man did as well. Miracle of miracles, our God is “big enough” that we can come to God as many different ways as there are people in this world. And God will receive him, you or I just like Jesus received Nicodemus. Because the God who made us LOVES US JUST THAT MUCH.